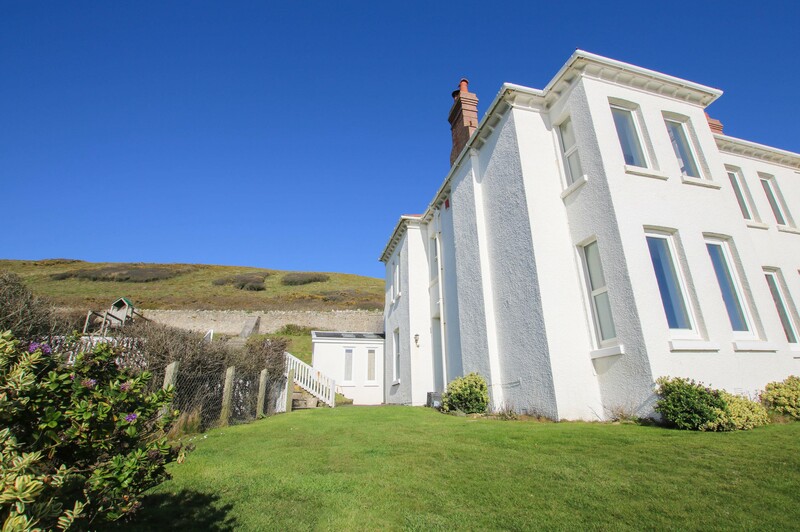 ** NEW PROPERTY ** The White House is an incredibly desirable rental property in Croyde which enjoys panoramic views of Croyde Bay, Baggy Point and across the Atlantic Ocean to Hartland and Lundy Island. Sleeping up to 10 guests across 5 bedrooms, this property offers wonderful family accommodation surrounded by style and character- with indoor HOT TUB! The White House is a commanding, semi-detached property which is accessed via a private lane, set just behind the South West Coast Path and borders the beautiful National Trust land at the rear. Being just a few moments' walk from Croyde's surfing beach, family and friends will find this property an extremely convenient base for a holiday which they will want to repeat year after year! This property is not only about the location, the home itself offers versatile and spacious living rooms and bedrooms, all of which are decorated with an incredible amount of attention and elegance. The kitchen is in the heart of the property and is fitted with all the necessities to conjure up the next family feast, including a range style gas hob, electric oven and dishwasher. From the kitchen, you will find large double doors leading into the dining room. This room is opulent, with a decorative fireplace and ornate furniture providing dining seating for up to 10 guests (with the use of extending leaves for the table). As the dining room is set at the front of the property, it enjoys spectacular views across the ocean - a meal with a view! From the other end of the kitchen, a light, bright breakfast room can be found. This particular room has a conservatory-style roof which lets in the North Devon daylight throughout the whole of the year. The White House living room has comfortable seating for all 10 guests. A large bay window to the front of this room has a fitted window seat, providing a wonderful place to sit back, relax and unwind whilst indulging in the magnificent views. These views are not only enjoyed on a bright, blue Summer's day, as a stormy day also provides ample drama and spectacle - enhanced by the roaring wood burner in the lounge. A bag of complimentary logs are available for your stay. A large 50" television is provided in this room. A further lounge/snug room across the hallway is filled high with books and games. There is an additional television, further decorative fireplace and writing desk in this room. The sofa in this room can also be arranged as a sofa bed for two (charges apply and only suitable for children). The staircase at this property appears to have come straight from a fairytale as it winds its way onto the first floor. The staircase splits into two sections, leading to the rear and the front of the property. Off the galleried landing to the front of the property, the Master room (with ensuite shower) and second double room can be found - once again, enjoying views across Croyde Bay and beyond. Two twin rooms are also found off this side of the staircase. A delightful family bathroom with roll top bath and walk-in shower is found off the back of the property, along with a bunkroom and separate WC. To the ground floor, you will find a large, wood pannelled wet room with two showers and WC. You will also find hanging space for you wetsuits. The shower room then leads into the desirable and ever-popular indoor hot tub room (included in the rental amount). Again, enjoying those spectacular views towards the sea. This property also benefits from a utility area with washing machine, tumble dryer, additional fridge and hand basin. The garden to this property is large and enclosed by an attractive, low picket fence (ensuring that the view is not obscured). The garden is arranged across several tiers of lawned areas, with a climbing frame and slide provided for use with adult supervision. The White House is removed from the hustle of the centre of the village, yet it is only a short walk to the village amenities when required. This property is incredibly desirable, with very few properties providing a similar, striking position whilst ticking so many other boxes for the 'dream holiday'! This property is pet friendly (up to two dogs). Bedroom 4 - Twin Room (Sleeps 2) If requested, this room could be configured as a super king bed. Add any extras/remove any extras that are available at the property. Including all those that are included in the CMS extras section on the online booking settings. These two areas should match. New Property Discount - £50 discount applied to any booking made prior to the 30th April 2019!